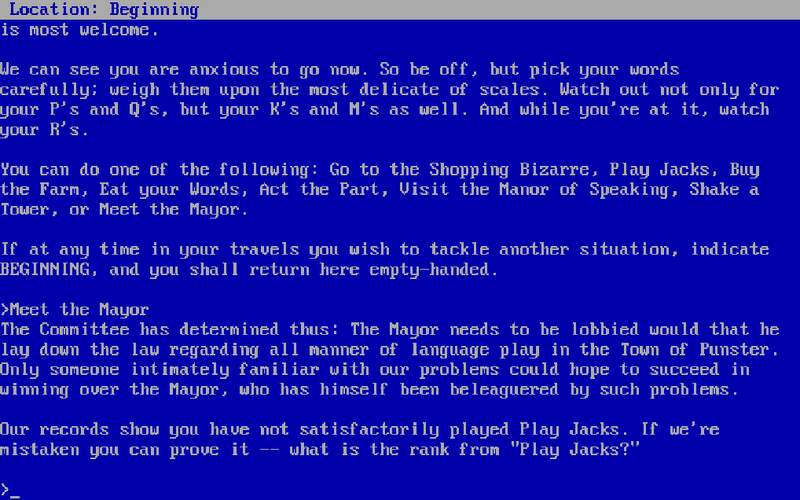 Well this is certainly an Infocom game unlike the others. No frotzing, no unwinnable situations, no feeding sandwiches to dogs (thank goodness). 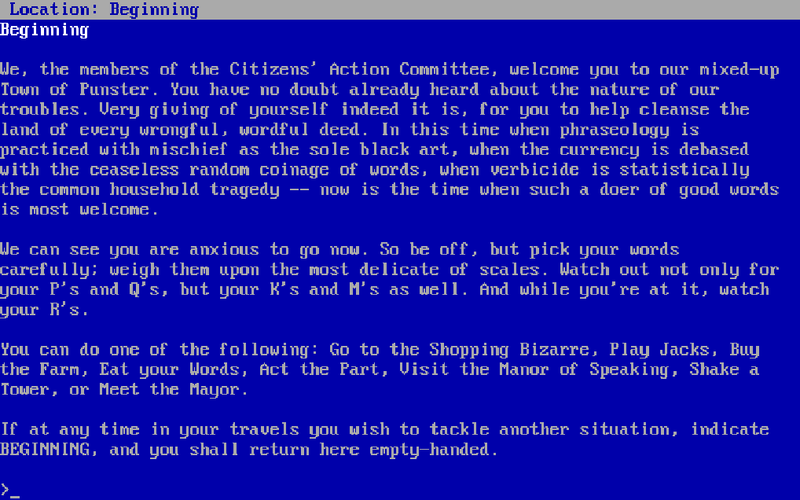 Released in the summer of 1987 for a bunch of different home computer platforms, Nord and Bert Couldn't Make Head or Tail of It takes a different route than the standard "go on an adventure" sort of set up that most text adventure games present the player with. See, where other games have you advance with plot, Nord and Bert replaces this concept with puns. So many puns, word play, spoonerisms, turning the dialogue on its head, this is indeed the one game where the pen is mightier than the sword. Also different is the game's structure: Instead of one definitive route from start to finish, players instead have the option to pick which scenario they want to tackle first and, with the exception of number 8, can play them in any order of their choosing. And although it doesn't affect the game play, I think it's worth mentioning the game's severe lack of feelies when compared to its Infocom bretheren. A single booklet of cartoons was all that came in the package. This one's just kind of an oddball all the way around, which combined with releasing closer to the end of Infocom's lifespan, is probably why it didn't sell that well. That all said, I'd like this to be a Let's Play Together and I'm encouraging comments and suggestions for things to try, ideas for puzzle solutions, or just dumb things you'd like to see the text parser react to. It's a silly game and I want it to be a silly experience. I love this game. Never played it personally, but I love it all the same. Functionally this screen acts as sort of a hub for the different scenarios you can pick from. Get stuck? You can come back here with the BEGINNING command and try a different one, but you lose any progress you've made toward beating the current scenario. This is also the screen you return to once successfully completing a scenario and getting the password that proves it. Well, maybe we should go Meet the Mayor and see if he can help us get a handle on the situation. Or maybe not! It looks like we'll need the passwords from the other seven scenarios first before being bestowed the badge of Best Belletrist and allowed to see the Mayor. Okay Talking Time, where are we headed first? That cover looks vaguely Far Side-ish. One vote for Eat Your Words! This game is probably responsible for a great deal of my life unfolding the way it has. Nice to see another Infocom LP here. That being said, I'm going to jump on the bandwagon and say Eat Your Words. Last edited by Falselogic; 11-09-2018 at 02:57 PM.